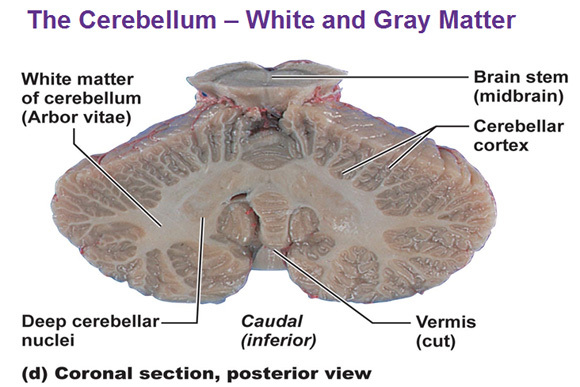 There’s an additional layer of gray matter internal to the white matter in the cerebrum and cerebellum called the cortex. Ventricles are CSF filled cavities (the things in blue) situated deep inside the brain. The two lateral ventricles have anterior, posterior and inferior horns. The interventricular foramen connects the lateral ventricles and the third ventricle. The cerebral aqueduct connects the third and fourth ventricles together. The fourth ventricle has a few holes called apertures, named by their relative positions, such as the lateral aperture and median aperture. The two lateral apertures provide a conduit for cerebrospinal fluid to flow from the brain’s ventricular system into the subarachnoid space. The flow of the CSF can be seen in this article. 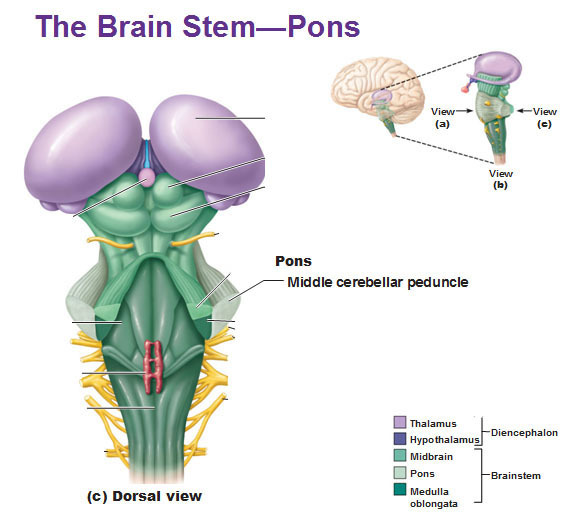 The brain stem is the most primitive part of the brain and is responsible for all automatic behavior (breathing, heart rate/force, blood pressure, hiccup/sneeze/cough/swallow). 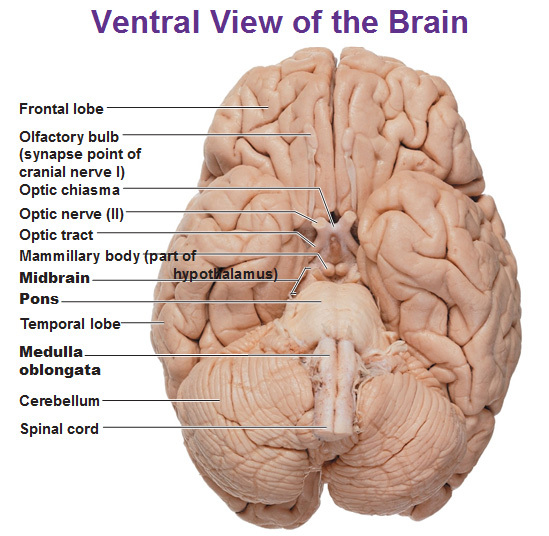 This is what connects the cerebrum and the spinal cord together and it’s heavily involved with the cranial nerves that innervate the face and neck. 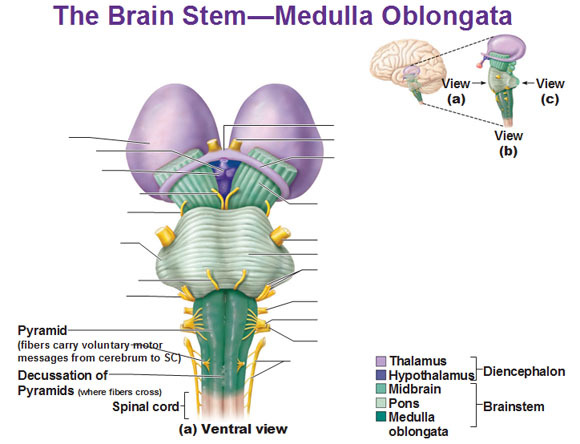 The medulla oblongata is the lower half of the brainstem. 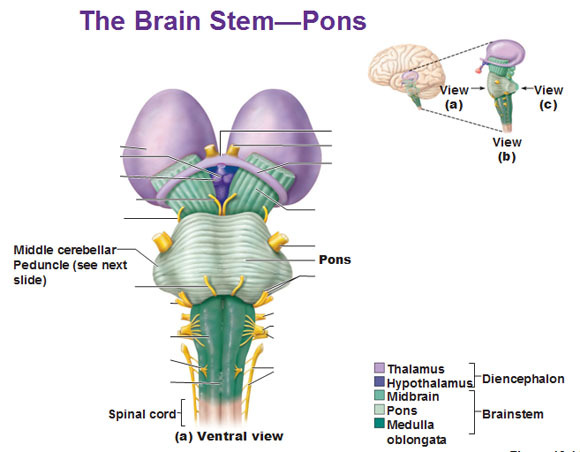 Where the spinal cord ends and the medulla oblongata starts anatomically is the location of the magnum foramen. Two front columns are called the pyramids where tracts of voluntary motor fibers run together. The decussation of pyramids cross fibers from one side of the brain to the other through the cerebral cortex. The olives are a relay station just anterior to the pyramids. 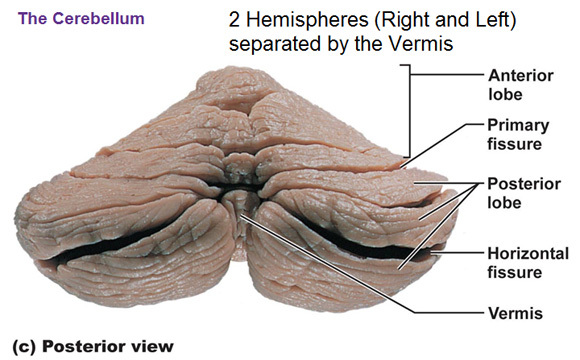 The medulla oblongata is anterior to the 4th ventricle wall (look how similar the shape is). 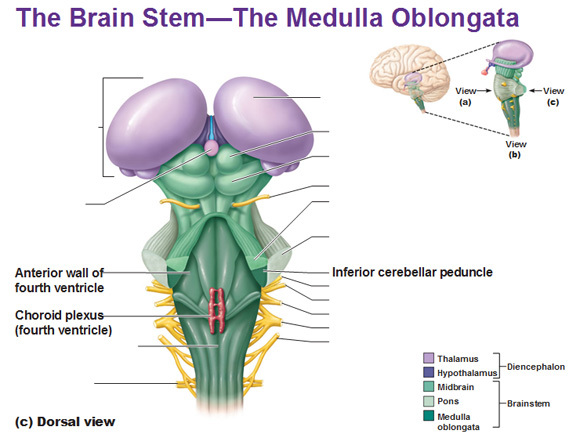 The medulla contains brain nuclei (nerve cell bodies) called the Reticular Formation. These nuclei control the reflexes of the nearby cranial nerves while the rest control visceral functions. 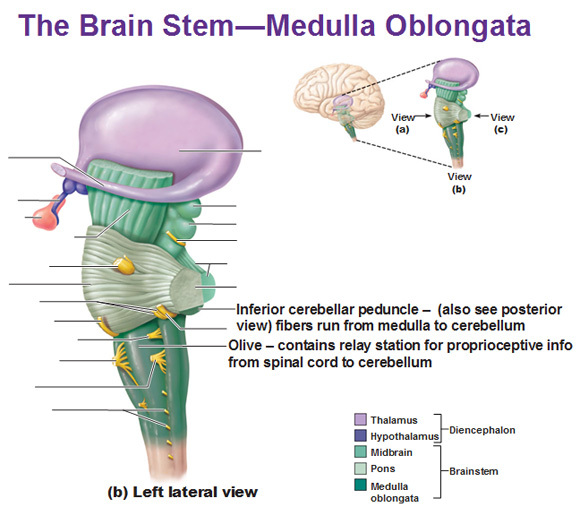 Superior to the medulla oblongata is the Pons (latin for bridge). 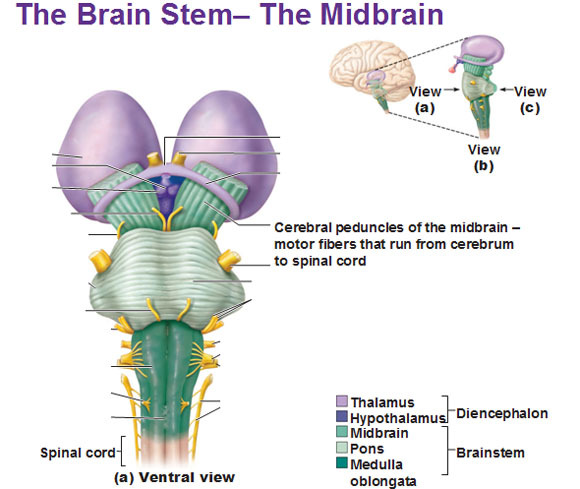 It is also inferior to the midbrain, and ventral to the cerebellum. 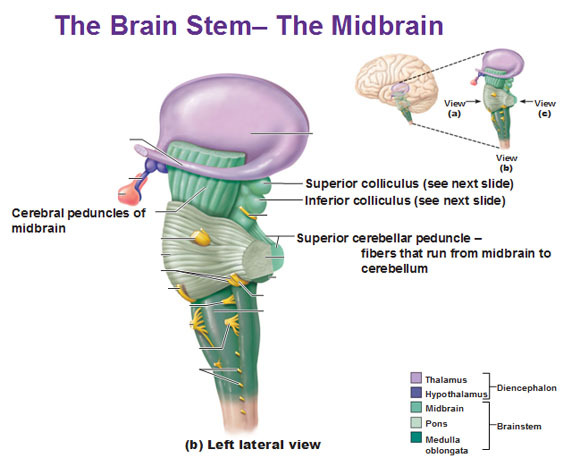 The mid brain includes the cereberal peduncles plus two superior colliculi and two inferior colluculi. The four colliculi create the corpora quadrigemina of tectum. 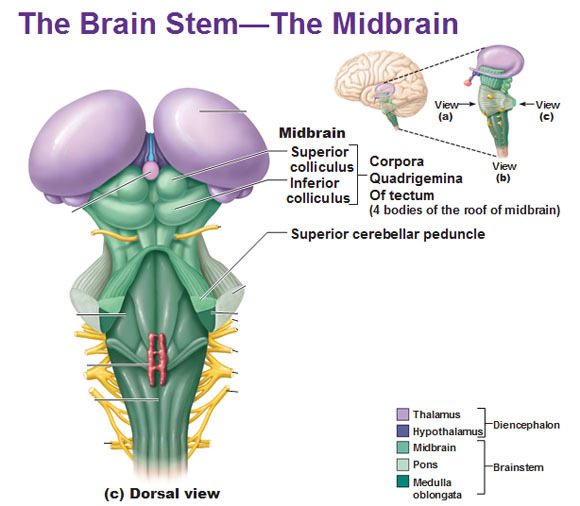 The cerebral aqueduct (mentioned earlier with the ventricles) runs through the mid brain and periaqueductal gray matter surrounds the cerebral aqueduct. Function: has to do with fight or flight reaction: Links the cerebrum’s perception of fear to the autonomic physiological reactions to fear… it can suppress pain or raise heart rate and blood pressure. Superior colliculus looks like balls. The inferior colliculus looks like… a tadpole or something. Located dorsal to the pons and medulla and separated from them by the 4th ventricle. Smooths and coordinates body movements. Helps maintain equilibrium and posture. 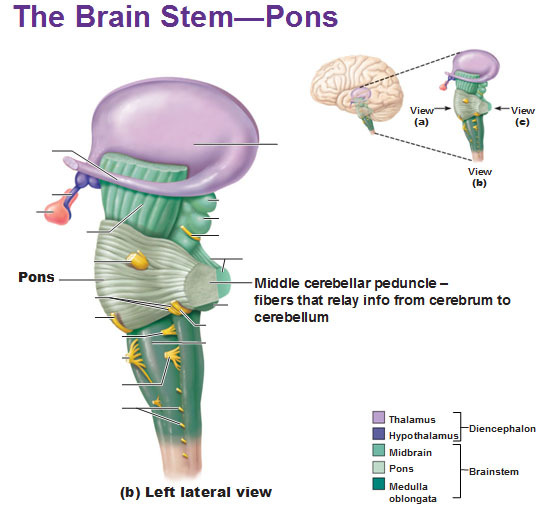 The cerebellum is useful in athletes as its involved with muscle memory and motor skills. A little bit of language/problem solving as well but it’s more so involved with something that has a lot of steps to it (like dancing). 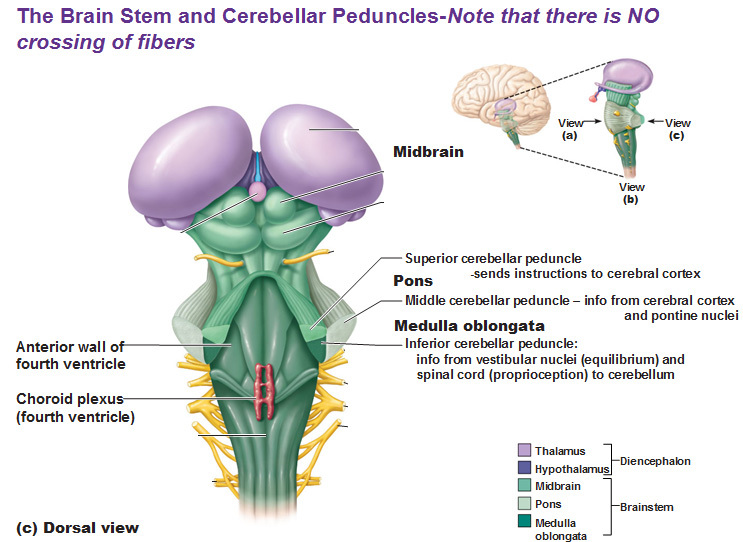 The cerebellum has to do with learning a new motor skill. Once mastered, skill becomes automatic – “motor memory” or “muscle memory.” It also plays a role in cognition, language, problem-solving, task planning by recognizing previous events. Review… the superior, middle (it’s actually lateral) and inferior peduncles. The peduncles are just fibers that don’t intermingle. The pons is on top so it sends to the middle peduncle.